Diwali is done and dusted, the lights are off and the crackers do burst but only a few. We had a small Diwali party at our house a day before Diwali, with a few of our neighborhood friends, the mood was cheerful, the conversation light, and the food was simple but party worthy home cooked fare. We did a little pot luck, where in I made the main course this time round, as all the Diwali sugar was getting to me, I needed to pull myself out of my self spun sugar web. Sali Boti is my go to dish if at all I have guests over at my place, and am required to make the mains, the reason is simple, its easy to make, with very few ingredients, its a parsi dish so it naturally comes out well, and it has oodles of lamb pieces with crispy, crunchy sali. Whats not to like? All Parsis love Sali, remember this Sali per Eedu recipe? Traditionally Salli Boti, is slow cooked over a tiny flame on a wooden fire, and since the parsis hail from erstwhile Persia, a land rich in dried fruits and nuts, an addition of dried apricots is made to make this dish, rich and festive (read consumed on New Year and Jamshedi Navroze - festival of spring). This dish gets its signature khaattu- meetthu (sweet & sour) flavour from two vital ingredients, Red sugarcane vinegar and Jaggery (traditional non-centrifugal cane sugar). Lets lookie at how to make it, and bookmark it for your next get together folks! 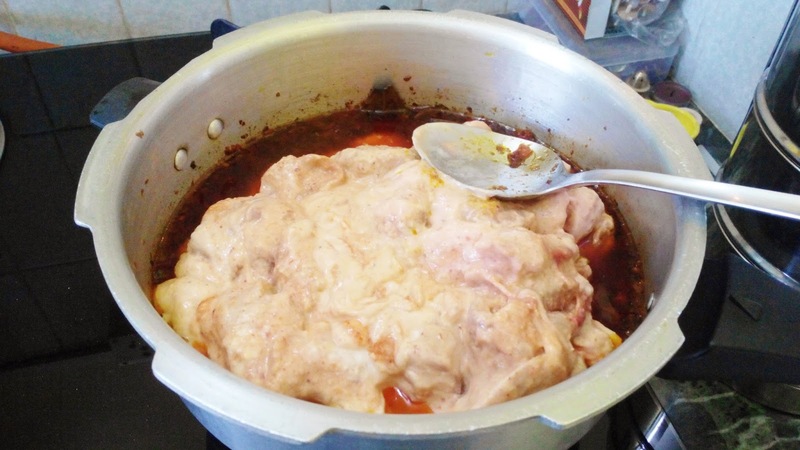 - Wash the lamb and marinate in ginger garlic paste. 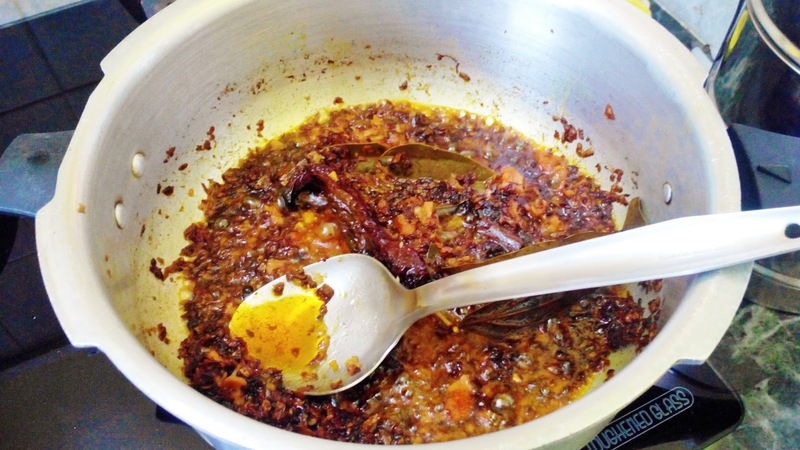 - Next heat oil in a pressure pan, and add in finely chopped onions along with chopped green chilies and fry till deep golden in colour, then add in chili and turmeric powders, saute till the spices loose their raw smell. -Next add in finely chopped tomatoes and cook for another 2 to 3 mins. 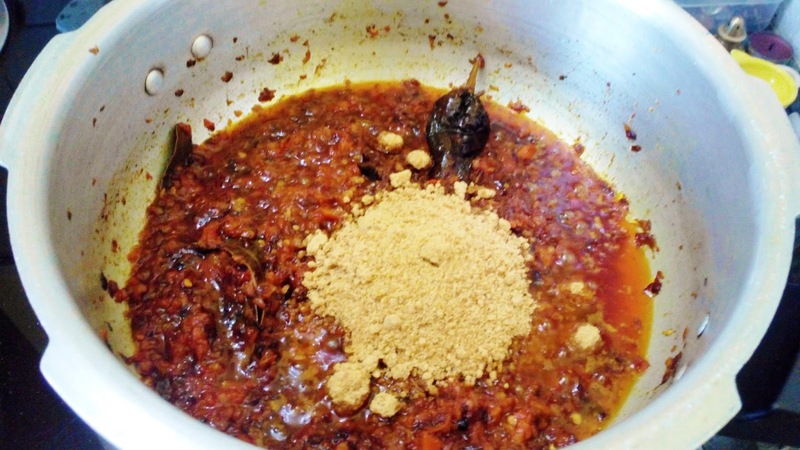 -Once the tomatoes are cooked add in the vinegar and jaggery, and cook for another minute. -Now add in all of the marinated lamb along with the marinade, apricots if using and salt to taste. -Cook on a slow flame, with the weight on, for one hour. -Turn off the gas after an hour. -Once the pressure pan is cooler, open the lid and add in the cumin and garam masala powders, stir and boil for a few minutes to evaporate excess water. -Garnish with fresh cilantro leaves and serve with chapattis (Indian flat breads) or pao (dinner rolls) topped with a generous helping of Salli! 1. Feel free to use regular granulated sugar in place of the jaggery, and regular white vinegar in place of the red sugar cane vinegar. 2. In case you cannot lay your hands on garam masala powder, fry in 4-5 black peppercorns, 1/2 cinnamon stick, 2-3 cloves, 2-3 green whole cardamoms, 1 piece mace and 1 piece star anise, along with the bay leaves. 3. Red chilly and cumin paste can be prepared by soaking in 3 red chilles along with 1/2 tsp cumin seeds in warm water and then making in a thick paste in the blender. 4. Use any chips of choice in place of Sali. Thinly slice a potato into sticks (alternatively use a large eyed grater), soak up all the moisture using a paper towel and then deep fry it until the sticks are golden brown.